Whatever happened the Habsburgs...and three other fallen dynasties? The story of the Habsburgs and other famous dynasties that are no more. 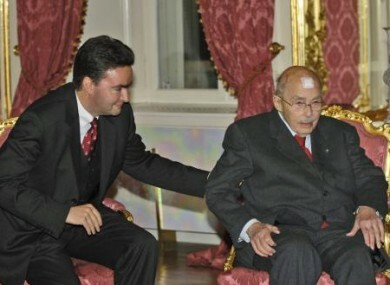 Otto von Habsburg with his son George on the occasion of his 95th birthday. THE HEAD OF the House of Habsburg and the eldest son of the last emperor of Austria-Hungary has died today at the age of 98. Otto Von Habsburg, son of Charles I, Emperor of Austria and King of Hungary, died in his home in Poecking in Germany this morning, according to his spokeswoman Eva Demmerle. He has lived there, in exile, since the 1950s. European Commission President Jose Manuel Barroso paid tribute to “a great European … who gave an important impetus to the European project throughout his rich life”. A self-proclaimed politics addict, Habsburg was an advocate of the European Union and campaigned for the removal of the Iron Curtain. On the day of his abdication in May 1961, he proclaimed himself to be “a loyal citizen of the republic [of Austria]“. Habsburg handed over control of the family affairs to his son Karl in 2007 but continued to be seen in public. His wife, Regina, died last year. He will be buried July 16 in the Emperor Tomb in Vienna, below the Austrian capital’s Capuchin Church. Born in 1912, Habsburg witnessed the demise of his family's dynasty when the Austrian-Hungarian empire was dismantled after World War I. In 1922, at the tender age of nine, he took over as the head of the family following his father's sudden death. However, at this point, Austria and Germany had lost World War I and the Republic of Austria had been born. Here is Otto (fifth from left) pictured with his seven younger siblings in Spain, just one of the European countries they lived in during their exiled years. Despite his life-time exile from Austria, Otto von Habsburg claimed to do a number of heroic deeds for his native land, such as helping 15,000 citizens escape the German Nazis and negotiating the country's postwar fate with world leaders. Before World War II broke out, he tried to become chancellor of Austria in order to fight the expected invasion by Hitler's troops but could not garner enough support. However, he said he did contact the White House during the war to plead with the US military not to bomb his beloved country. He has claimed these conversations stopped the US Army from bombing certain towns and cities in Austria. Here he is pictured in a hotel room in Washington in 1942. Archduke Otto of Habsburg, as he was then known, married Princess Regina in 1951. At this time, Habsburg was also known as the Pretender to the Austrian throne as he still refused to give up his claim to the title. In an interview with a newspaper in the 1960s, he likened politics to opium, stating it was impossible to give up once it had been experienced. In 1966, five years after he finally abdicated any rights to the monarch he was allowed to visit his native country. However, he was surprised to return to a hostile environment and much criticism. The story of the last Russian tsar is violent from start to finish, which led him to be nicknamed, Bloody Nicholas. His actual title was Nicholas II, Emperor and Autocrat of All the Russias. His completely unsuccessful rule saw Russia being defeated in the Russo-Japanese War and fatally enter World War I. However, he is mostly known for the leading role he played in Russia's Bloody Sunday massacre which saw 92 peaceful protestors die after soldiers opened fire on them. Image - soldiers outside the Winter Palace in St. Petersburg on Bloody Sunday. Although rumours persisted for years that one of Nicholas II's daughters escaped the Bolshevik massacre and travelled to Australia, the theory has been disproven. According to Dr. Michael Coble of the US Armed Forces DNA Identification Laboratory, the remains of all four of his daughers have been accounted for. One imposter, Anna Anderson, who claimed she was Anastasia had her lies unveiled after her death when DNA tests were carried out in 1994. Although untrue, Anastasia's "story" has inspired books, films and musicals to be written in her name. The last monarch of Italy's rule lasted just a few weeks before a popular referendum saw the introduction of a new republican government in 1946 and the disintegration of the House of Savoy. Umberto II, son of Victor Emmanuel III, served as the last King of Italy for slightly over a month, from 9 May 1946 to 12 June 1946. The short reign offered him the nickname the King of May. In 1946, the Italian electorate got to choose between creating a republic or keeping the monarchy. Once the votes were counted, the House of Savoy, were forced to leave the country. Victor Emmanuel III became King of Italy in 1900 and remained in that position until he was ousted in 1946. One of his last decisions as ruler of Italy was to appoint Benito Mussolini to the position of prime minister on the one condition that he supported the monarch. Victor Emmanuel died in Egypt a year after his family were forced into exile. Image - in better times for the family. The King and his Queen Elena in 1937. The titles of the remaining members of the family are not recognised by Italy but are still used by the Savoys themselves. Currently, two cousins - Vittorio Emanuele and Amedeo of Savoy - are fighting for the "title" of Head of the House of Savoy. Reports of the pair coming to blows at a dinner in 2004 were followed by the news of Vittorio Emanuele's arrest in 2006. He was detained and placed under house arrest by Italian police on charges of corruption and recruitment of prostitutes for clients. Vittorio Emanuele, also known as the Prince of Naples, is the only son of the last monarch, Umberto II. When the Ming Dynasty fell after a popular revolt in 1644, Emperor Chongzhen not only ended his own life, but took most of the imperial household with him. As the Opposition fighters made their way into Beijing, Chongzhen gathered members of his family together, except his sons, and killed all of them with his sword. One daughter Princess Chang Ping survived the attack but had her left arm severed. Under the new rule of the Qing Dynasty, the Princess asked could she become a nun. Her request was refused and she was forced into an arranged marriage. However, Chang Ping died a year later. She was 17 years old. The Ming Dynasty ruled China from 1368 to 1644. An army of one million troops kept watch over China until a slew of agricultural, economic and political events challenged its authority. Opposition leaders found support among the peasants as people's livlihoods were affected by crop failures, a lack of silver and serious illness. Chongzhen ruled since he was 17 but his paranoia always hindered his rule (Many of his suspicions were well-founded however as internal corruption and an empty treasury highlighted). From the get-go, his reign was blighted by challenges to his authority. At the very beginning, he was forced to eliminate Wei Zhongxian and Madame Ke, who had become de facto rulers of the empire. Then in 1630, he beheaded the famous general Yuan Chonghuan, who had maintained the northern frontier against their rivals. Email “Whatever happened the Habsburgs...and three other fallen dynasties?”. Feedback on “Whatever happened the Habsburgs...and three other fallen dynasties?”.